The other day I was trawling through the internet and an article caught my eye. It was an article by Dan Scotti and was about the psychology behind messy rooms. 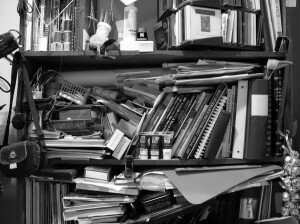 Dan challenges the idea that being organised is a direct key to success and that being messy is a quick path to failure. As Dan points out ‘There has always been this sort of “urban legend” that has floated around modern society deeming people with messy desks as having a high affinity for creative reasoning.‘ I was attracted to this article for a number of reasons. I am an inherently messy person (just ask my family). But I am also an inherently messy thinker. 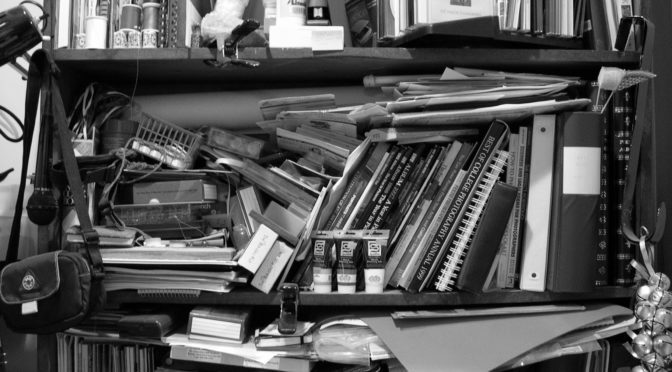 And I believe that it is this messiness that results in my being a creative person. The article goes on to propose that creative minds choose to think outside of the convention of the desk (or conventional storage) in the same way that they think outside the lines of “conventional” reasoning. So, I hear you ask, what has this got to do with safety? Traditionally safety has tended towards organisation. Safety management systems, procedures, risk assessments and incident investigations. The idea that safety can be brought about through defining the right way to complete a job. Through planning and documenting the steps. The idea that hazards can be identified before a job commences and that the right controls can be identified and implemented. The idea that even if something goes wrong that an incident investigation will identify how to prevent it from happening again. So much certainty. So much neatness, with a place and a box for everything. It is this type of approach to safety that has stifled creativity and out of the box thinking. And without this there is no adaptation (unless people are willing to work outside of the system). It was with interest and amusement that I read John Green’s post Paper Tigers. I echo John’s sentiment that it is not about simplification of systems but rather it’s about changing their purpose. Because if the purpose of a system was to help people to deal with the messiness that is everyday working life then it would be a very different looking system. If its purpose was to enable people to adapt to the constantly changing work demands then who knows what the system may look like. I suspect that the sorts of systems that we need look vastly different to typical safety management systems. In fact, I think that we need to smash the mould and each of us start again. It is more than using existing approaches and inserting positive language. In some cases it will be solutions that we have yet to think of. I don’t have the answers of what a progressive safety management system looks like (although I do have some ideas). But I strongly feel is that the systems of the future need to enable creativity within our workforce and without creative thinking we will never get there. At a local museum recently there was an exhibition consisting of a series of photographs by a well known photographer of the painter Picasso taken in his studio – a spacious, high-ceiling apartment with big windows and lots of light. While not a Superfund site the studio was filled with paintings in stacks on most surfaces, flowers in vases, tools of the trade and of course the artist caught in a variety of working and contemplative poses. This is not a place where those devoted to well-ordered settings would likely feel “at home.” Not unlike the photo in the Elite Daily article, but more high-end artistic achievement I suppose. What we know from complexity studies is that development of fresh thinking about challenging situations depends upon a wide range of diverse perspectives. Ecosystems which are disturbed (e.g. by forest clear-cutting) sometime decline rapidly, and other times don’t – ecologists identified what they term “requisite species diversity” as an overall measure of a systems resilience in the face of formidable challenges. My office with its books and papers in stacks all around is suggestive of how “requisite diversity” might apply to knowledge work. I keep all those smart people close at hand to stimulate my thinking and much of my work in progress available to consult as I seek solutions to sticky governance situations. Interestingly I usually have multiple tabs open in my browser, many big Adobe files one click away, and when I save something to the hard drive file structure (an almost entirely ad hoc mess of course) I can have real withdrawal feelings about “putting something away” where I’ll never find it again. This all is significant in light of the question: how did we end up with Safety Management Systems that become brittle with hard compliance structures? Ones which are seemingly incapable of innovating in the face of a less than familiar planning or the periodic unanticipated upset circumstance? In my experience most ineffective planning or inflexible response to off-normal conditions showed evidence in the after-review of too little breadth of perspectives brought to bear in the moments of high leverage toward success or failure. Reliability imperatives drive us toward using the “expert” and deferring to the respective functional stovepipes when progressing a work package through the development and concurrence processes. This is great for reliable conduct of the familiar and very predictably perilous in circumstances where a call for Resilience might be warranted. It is not that our basic processes for assurance of adequate protection need to be scrapped or massively rethought. Seeking Reliability is not, per se, to blame for preempting the accumulation of some Resilience reserve in a plan or work group. Rather I suggest, that leadership, those with the prime responsibility for Doing Work Safely, needs to hone the skill of recognizing when there is less than adequate diversity of perspective and relevant experience being brought to bear in a developing situation. Then they have to demonstrate the nerve to call in the help, Reliability, as in cost and schedule efficiency, be damned. I enjoyed reading about your thoughts on diversity. In particular your comment on recognising when there is less than adequate diversity of perspective. This got me thinking about the process of generating ideas and solutions and how that fits with consultation. In my experience consultation usually involves getting employee input on an already thought out and and mostly developed solution. This could be a procedure, new initiative, process, control etc. The problem with this is that someone has already decided that the solution is already the right one. The person was usually an ‘expert’, maybe even a ‘safety expert’. As an expert I guess that there are expectations that you know what the right solution is. How many safety experts or safety professionals are prepared to say ‘I don’t know what the solutions is’? How many are prepared to say ‘I will facilitate the best possible outcome that I can by seeking a diverse range of perspectives’? Because if we did say that, then why do you need safety professionals? Why wouldn’t an organisation utilise people who are good at asking questions, listening, communicating, bringing people together, seeking out ideas? Or maybe that is what safety professionals should be. And in that case, why shouldn’t safety professionals come from all different walks of life? Why couldn’t an artist work as a safety professional? I am feeling my next post coming on. P.S. Your working style sounds very similar to mine. The discussion seems to fit well with Erik Hollnagel’s “Safety II” concept…. Hi David. I am a fan of Erik Hollnagel’s work but I am cautious about labeling an approach as one thing or another. I understand that many people look to theories, concepts and approaches in order to help them apply their profession. But to me it is fairly simple. Just go for it. Go with what is the appropriate solution at that point in time to support people in being successful. That is my approach.